In society today, role models appear in various forms – from our own mothers, to business leaders to those with celebrity status. These individuals possess the kind of qualities that we would all like to have and affect us in a way that motivates us to be better people. Often when we realize our growth was inspired by a role model, we become ignited with a passion to share what we have learned to benefit others in the same way. 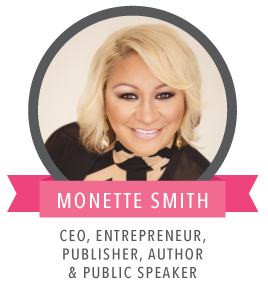 Monette Smith has experienced a phenomenal level of success in her life and business ventures and she is excited about sharing what she has learned along the way to help you grow and reach your goals. Even more, she hopes to inspire you to keep the torch going to ignite passion in others, as she teaches you how to leave a little SPARKLE wherever you go! Listen to her in action! Click here to hear the radio interview. Copyright© 2014. Monette Smith | All rights reserved. Theme by PR Marketing, LLC.